‘Voyages’ sees the return of internationally acclaimed Russian artist, Anna Berezovskaya, to REDSEA Gallery, in yet another solo exhibition. This exhibition will explore the symbolisms, metaphors and processes behind Berezovskaya’s canvases, focusing on the concept of love and home. 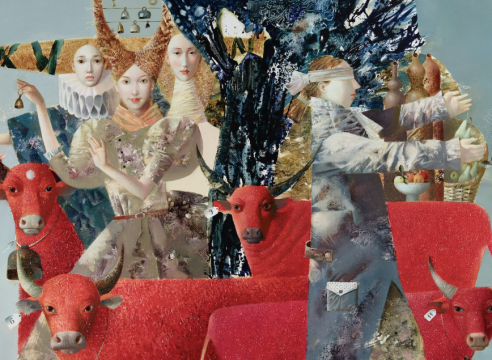 Anna Berezovskaya’s works are infused with elements of fairytales, Surrealism, and Abstraction. Interweaved into her visual narrative is a visual vocabulary replete with her emotions and inspiration. She calls her unique style Poetic Realism. Her pieces are riddled with symbolisms which the viewer must tease out in order to find the multiple meanings and layers to them. In this current series, symbolisms associated with the sea, food, and home are presented through vivid colours and stories residing in her unconscious. This is because Berezovskaya wants to share her notions of amour and hearth that have accompanied her on her life journey so far. Berezovskaya’s works are built on a world which she has created—a visual world—where she tells her stories through childhood memories of books read and images embedded in her dream-space. 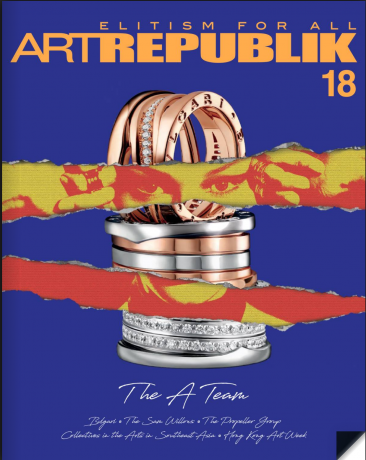 “I still draw on stories that I love from my childhood but in terms of development I realise I have developed and grown and my ideas are becoming more interesting, sharper, more developed,” says Berezovskaya. Discovered by REDSEA Gallery in 2011, and nurtured by the Gallery which has exhibited her at prestigious international art fairs, Berezovskaya has indeed grown from strength to strength as an artist. 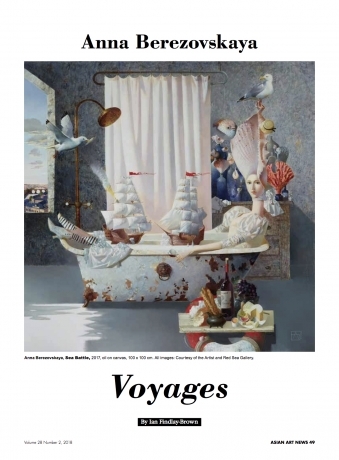 In ‘Voyages’, Berezovskaya shows a sharper and more developed sense of detail, with her signature essence of the whimsical, infused with humour, that seeks our attention in order to enter her inner world. Although one recognises Russian cultural and literary elements in these pieces, universal themes play hugely too, but with Berezovskaya’s personal touch. Her canvases are filled with personal pursuits for the meaning of happiness and the universal pursuit of love, this time all centred on the motif and metaphor of home. These themes will resonate with everyone. In ‘Birthday Together’, a couple is pictured on an island, sharing an intimate moment together. They are staring upwards into the sky above which is represented by a giant moon behind them. On a table is a birthday cake, frosted over with icing sugar and decorated with cherries. By the couple’s feet are their shoes, a conch, pebbles and a mooring line attached to a peg. In this picture-perfect sense of home, Berezovskaya depicts a realm where love exists in solitude, represented by the lone couple on a small piece of floating land. The tension between intimacy and separation is witnessed in the couple’s detachment from each other—they are looking up and not at each other—yet it is not the separation but the intimacy that Berezovskaya is depicting. “In love, we don’t always have to look at each other to be with each other,” she explains. But it is the idea that we must all have somewhere we can call home in ‘Birthday Together’, and a place where we can moor ourselves, symbolised by the mooring rope attached to a peg, that gives this oil on canvas a deeper meaning. In ‘Voyages’, Anna Berezovskaya is reflexive about who she is and what she desires amidst the constant flux of the 21st century. She portrays a strong sense of what she understands to be the universal meaning of love and our search for it: there is suffering in this search but there is also joy. The pieces at this current exhibition speak of a personal experience in the pursuit and finding of love and home. “It seems to me that every person should have his own piece of land, where he feels happy,” Berezovskaya explains. Fantasy and reality are at the heart of Russian artist Anna Berezovskaya's paintings. Viewing her work is always a great pleasure as her complex narratives challenge our imaginations in broad social, psychological, historical, and artistic terms. Art is a lot of things: a picture on the wall, a reflection of the artist’s personality, a cherished memory, a collector’s item, and so on. But above all, art is an experience, and this comes through strongly in Russian artist Anna Berezovskaya’s richly narrative artworks, which will be on display at REDSEA Gallery from 12 May to 10 June 2018.